The P90X (by Tony Horton) is a little more intense in this area than is the Supreme 90 (by Tom Holland). Both will get you quite toned, but the P90X is a little edgier. One area the Supreme 90 falls short is with the lat muscles as it almost completely ignores them, while the P90X tries to rip them off your body. If you use the Supreme 90, it is well advised to purchase a pull up bar and add that to your routine. P90X workouts last about an hour with the yoga portion lasting and hour and a half. Then after that, you are still supposed to insert the Abdominal DVD and go for 10-15 more minutes. Supreme 90, however, is over in about 30-40 minutes. The ab and core exercises are imbedded with each workout, so there is no need for an additional DVD workout. The shorter workout does not mean easier, Supreme 90 moves a little faster through the exercises. I believe this to be the P90X weak spot, while it is the strength of Supreme 90. As stated above, the ab workouts on P90X are on a separate DVD that you must insert after you have done your strength training routine. Furthermore, P90X just forgets altogether about lower back strengthening. (A major part of the core!). Supreme 90 includes core with all their workouts and focuses well on the lower back. P90X has three cardio DVD's. Plyometrics, Cardio X, and Kenpo. The Plyometrics is one heck of a cardio workout. It lasts about 50 minutes and leaves you begging for mercy. CardioX is average while Kenpo is a waste of time. The Supreme 90 has two Cardio workouts. The first is the Tabata Inferno which is a 35 minute beast that includes a little of everything. The second is just called Cardio and is about the same intensity as the P90 CardioX. Providing you throw the Kenpo DVD in the trash, P90X and Supreme 90 are about equal. If you have balance problems, knee problems, coordination problems, or need to avoid high impact workouts, than do not buy the P90X. It's Plyometric DVD is high impact in the extreme. P90X also includes some rather dangerous exercises such as one arm push ups, air born push ups, and towel pull ups. I always wondered why these were included. Regular pull ups and push ups will get you in just as good of shape without the added risk of injury. 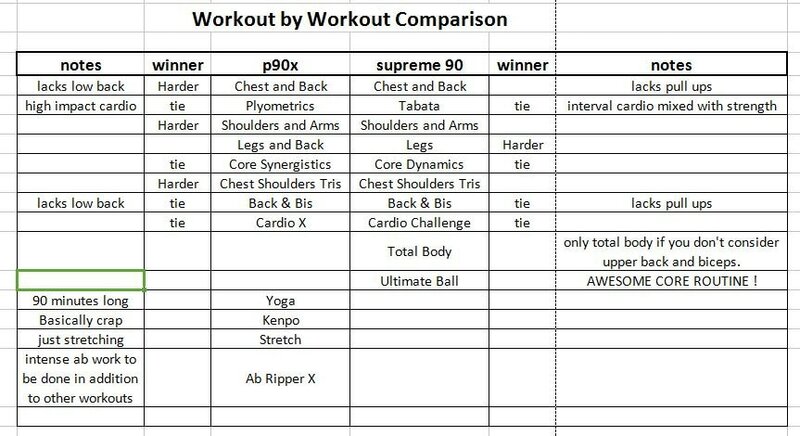 Supreme 90, on the other hand is a much safer workout. It still has a few questionable exercises, but not near as many and therefore is a lot safer for the average person. P90X includes a yoga routine in the mix. It takes about an hour and a half and leaves you praying for it end after 45 minutes. If you ever thought yoga was for wimps, I beg you to go ahead a purchase P90X so I can laugh at you when you do this routine. The Supreme 90 has a core workout routine called "Ultimate Ball". It lasts only 30 minutes, but you will use muscles you never knew that you had. It won't feel like 30 minutes. Who should choose the P90X? If your concern is to be the best and the baddest and to look the hottest on the beach, then the P90X is for you. It is more focused on muscle building and it comes with certain bragging rights. Everyone has heard of it and they are impressed if you complete it.